I have been making this recipe for years. It makes a great side dish for Mexican type meals. This recipe came from an Old Taste of Home magazine. I love their recipes from the 1990’s. I have used and still use many of their recipes. 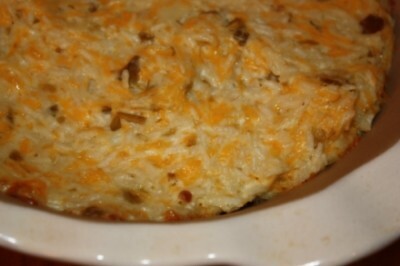 I have made this as a side dish for many Mexican type meals, but I have also taken this to church potluck type dinners. It is always a popular dish. I will say though that this particular recipe contains minute rice. I am not usually a fan of minute rice, but in this recipe it works the best. I have tried it with regular rice and it just does not turn out right. So, I usually keep a small box of minute rice on hand just to use for this recipe. This rice dish is really the only thing I use it in because I have not found anything else I like it for. In a large bowl, combine the soup, sour cream, chilies and cheese. Stir in rice. Transfer to a greased 1-1/2-qt. baking dish. Bake, uncovered, at 350° for 20 minutes or until rice is tender. Hey, wanted to say hi and will be fun to meet you in Nashville! I have a similar recipe with eggs – delic! @Amy @ Finer Things, 🙂 You might be able to tweak it some to do that. The texture was just not right with regular rice. You might be able to get it right by adding some liquid to it, maybe chicken broth and make it work. If you try it let me know how it turns out. I’m opposed to white rice of any kind but I would totally use it to make this recipe for a special occassion (meal for guests). This sounds super yummy! I use Minute Rice almost exclusively for a broccoli cheese casserole recipe that I make a lot – it’s my daughter’s favorite. Interestingly, the recipe is from an old Taste of Home magazine (from the 90s). I’m coming from Tasty Tuesday and thought I would comment because this looks fantastic as well as delicious. Chili is one of my favorite foods, so I cannot pass up a good recipe with chili! As a college student, I find it hard to make food I love since I am usually only feeding myself and money is tight, but this recipe looks really simple and inexpensive, so I may try it and mix it into my meals throughout the week. Thanks for the recipe! Oh my goodness!! I have never made this before and KNOW we would love it at our house. THANKS!!!! would you post your cream of chicken soup recipe at some point? I hate using all the preservatives in the can, but sometimes it is the only thing to make a casserole dish have the proper texture. @Katie, I am still tweaking my homemade cream soup to get it just right. When I do I will be sure to post it. Yummy! This sounds fantastic =D. This recipe is very similar to a broccoli and rice recipe I make. It does not work well with any rice except minute rice either. made this tonight! added some chorizo and onions, the hubbs LOVED it. In fact we are going to have the left overs tomorrow!!!!! Thanks for the great recipe. My husband would love the chorizo added to it. That is a great idea! I am so glad you enjoyed it and thanks for sharing your version.